Elections where a ruling party wins 100 percent of the seats in parliament should always ring alarm bells. 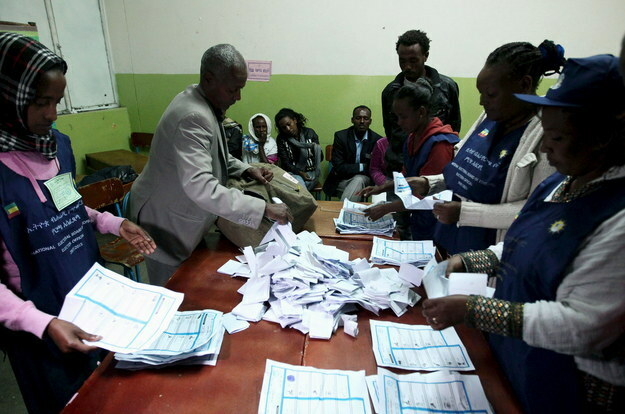 Results in Ethiopia from the May 24 general election, released yesterday, are no exception. According to Ethiopia’s National Electoral Board, the ruling Ethiopian People’s Revolutionary Democratic Front (EPRDF) coalition won 546 parliamentary seats (with the 547th seat still to be announced). The results shouldn’t be seen as a stamp of approval for Prime Minister Hailemariam Desalegn’s government – rather they are the inevitable outcome of a political system in which opposition parties face extraordinary challenges and nearly all avenues for citizens to engage in political debate are closed. The seeds for this situation were sown years ago. Since the last election in 2010, in which the EPRDF won a mere 99.6 percent of parliamentary seats, political space has been further restricted: the independent media has been decimated, civil society groups virtually eliminated, and peaceful public demonstrations quelled, sometimes by force. The crackdown on opposition parties and their supporters was the final piece of the puzzle. In the lead-up to the elections, the authorities arrested leading members of the opposition and put them on trial on trumped-up terrorism charges. Political parties reported difficulties in registering candidates and acquiring funds to which they are legally entitled. Security force personnel arrested and harassed people organizing rallies, confiscating their equipment and unfairly denying them permits. Over the last two weeks, several opposition members and candidates have been beaten to death in suspicious circumstances. International observers were largely absent, choosing not to monitor a vote that provided little opportunity to be independent and effective observers. The African Union was the exception, concluding that the elections were “calm, peaceful, and credible” – a standard very different from being free and fair. The European Union and the United States, two of Ethiopia’s key allies, were largely silent on the political crackdown. Instead, they congratulated Ethiopia for a “peaceful” election, more concerned with the increasing potential for violence than with a fair electoral landscape. This is short-sighted and dangerous. Authoritarian control rarely provides long-term stability and nearly always compounds significant human rights violations. For many Ethiopians, the elections confirmed what they already knew: the ruling coalition completely controls all aspects of their daily life and permits no alternative political views. The question is, when will Ethiopia’s allies open their eyes?